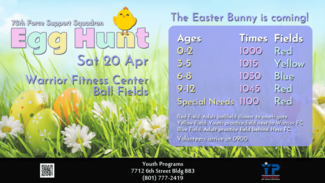 Interested in Volunteering for the annual Egg Hunt? If so, sign-up today. We will be meeting at the baseball/softball fields East of the Warrior Fitness Center at 0830 on 20 Apr 2019 for this 3 hour volunteer opportunity. Thank you for your support; we look forward to your help.